The eerie official silence in the wake of the Norway massacre. In the event you have no opinions on Anders Breivik, you’re a moron. This is why I’m surprised that I haven’t seen or heard from Christianity's leaders on the matter. I’ve gone from the Vatican to the Saddleback Ministries, and then some, and I’ve got to say I’ve been getting nothing back in response from all but one (and to add an insult, that one made a precursory statement of no comment). The only thing I could gather from my attempted correspondence with Christian leadership is that Rick Warren doesn’t want to say anything unless he and his people know my angle. It’s like they’re all too afraid of their own shady scriptures to condemn them, or perhaps they condone it and they just don’t want the non-Christian parts of the world to know their true colors. Why are a majority of Christians silent and unable to publicly condemn (or at least disown) a fundamentalist Christian that committed an act of terror? I mentioned the Vatican already, but their silence has reminded me of their semi-silent acceptances of larger, more organized, mass killings. The lack of response from the Vatican shows the world just how Ratzinger feels about Breivik. I may as well lump the Vatican in with Westboro Baptist Church. At this point, only the WBC has anything to say about it; nothing nice, but at least they have the balls to come out and say what they really think instead of being silent to avoid lying. Pat Roberts and his ministry: nothing. Trinity United, ditto. 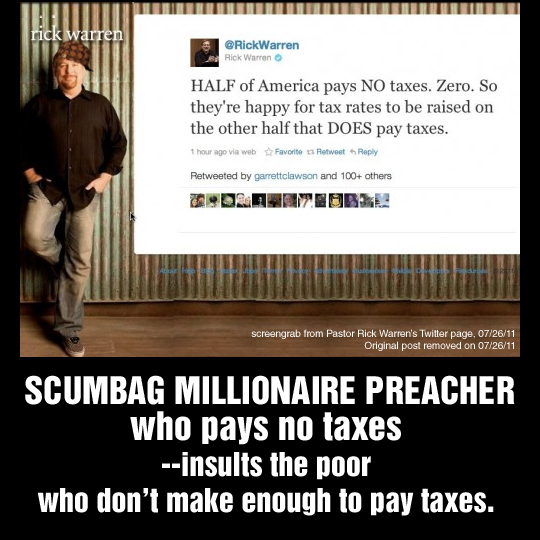 I thought maybe Rick Warren would offer an opinion. After all, around 2006, he was saying that Fundamentalism in religion would be a danger to society. Why not hold Warren to his words, call him on BS, and see if he’s willing to lead by example? Instead I got a reply via email stating that neither he nor his ministry has made, or is willing to make a statement. But the next day via Twitter he asks people to pray away the pain. I guess a deleted tweet says more about what Warren really finds important at times like these. Perhaps my focus should be on Rick Warren; after all he probably doesn’t want to believe Anders Breivik is a Christian. I have a few Christian friends who have told me what they think of Breivik. I have to wonder who is leading whom if the Pulpit is typically quiet while the masses speak with mixed feelings. I’m not saying that all Christians condone the actions of Breivik, but it is shocking to put the voices in perspective. The religious leaders should be leading the charge on this one. Obama: I'm a Loser, Baby, So Why Don't You Ditch Me? I really do think the coverage of Breivik is appalling. Nobody is calling him a terrorist simply because he is white and looks good. Fact is the man deserves to die for his crimes. Agreed. But the reality is that while any number of parents of those slain would line up to slit his throat, he'll probably serve seven years in some health spa passed off as a jail. That's Norway. Actually he can spend longer than his maximum sentence in prison in Norway if he's viewed by their legal system as a danger to society. Which penal system were you referring to again?